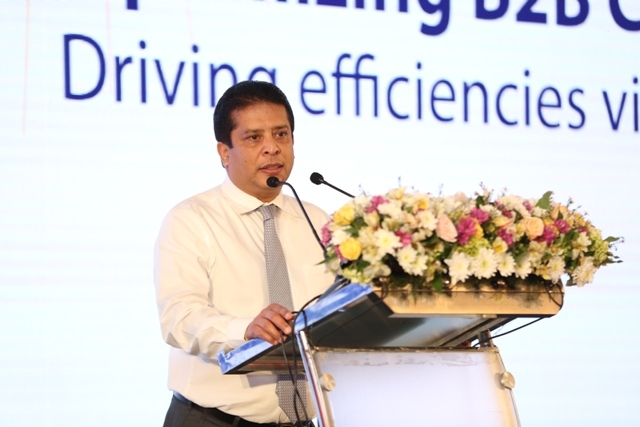 DFCC Bank in partnership with Visa recently hosted its corporate clientele at the launch of its DFCC Visa corporate credit card on 23rd January 2019 at the Hilton Colombo. The exciting launch was celebrated in the presence of almost 200 attendees, consisting of the Group Country Manager and several Senior Representatives of Visa, senior management from DFCC Bank and leading local corporate heads. DFCC Bank’s new corporate credit card provides an unbeatable proposition for companies to make payments more conveniently and with greater transparency, thus giving them better control to manage operational expenses effectively. Offering some of the best deals in the market, its benefits include enhanced security, accountability and better cash flow management, thereby reducing instances of fraud or misuse, which are key concerns for companies at all times and even more so when operating in tough macroeconomic conditions. DFCC Bank has ensured that with this card, companies can enjoy higher discounts on card programmes, which translate into greater savings in the long run. Considering that travel and entertainment expenses form a substantial proportion of company spend, using the DFCC corporate credit card is an economical way to please employees while simultaneously earning big savings offered on the card by vendors. Most often, these savings may not apply to non-corporate credit cards or cash payments. Online and card payments are highly common and employees expect to have corporate credit cards to make purchases on behalf of the company or for work related expenses. This is where DFCC’s category specific corporate credit cards come in use. The category specific credit cards such as the Fuel Card, Travel Card, Online Payment Card, Vendor Payment Card, Utility Payment Card etc can be distributed amongst employees depending on the need. The category specific cards, for example, for purchasing fuel, empowers companies to track spending of employees and processing spending becomes simpler at the end of the month. The DFCC corporate credit card offers even greater convenience with services such as consolidated statements for all cards and interactive e-statement to monitor monthly spend trends. Corporate customers can also enjoy an interest free credit period of up to 51 days, which can bring working capital benefits to companies. Users can also enable automatic monthly bill settlements on the card. Yet another key benefit is that the DFCC Corporate Credit Card can be integrated with DFCC iConnect; a state-of-the-art payments and cash management solution as well as DFCC’s interactive eStatement, which provides a deeper and more interactive insight into the spending patterns, thereby enabling customers to enjoy a comprehensive and superior service experience. A dedicated 24/7 Call Center is also accessible for corporate customers to have their queries attended to. Companies can also enjoy amazing value additions such as free travel insurance cover of up to USD 60,000; access to Visa Worldwide hotel, flight & restaurant deals; and integration with DFCC iConnect for a total Business Payments & Cash Management solution. DFCC Bank PLC is a fully-fledged commercial bank offering the full gamut of commercial and development banking services. The Sri Lanka Institute of Management Accountants (CIMA) and the International Chamber of Commerce of Sri Lanka (ICCSL) has announced DFCC Bank as one of the ten “most admired companies” in Sri Lanka for 2018. The Bank was also ranked No 14, in Business Today’s list of Top 30 businesses in Sri Lanka. Fitch Ratings Lanka Limited has rated DFCC AA- (lka). The Bank prides itself on delivering tailor-made products that are designed to meet the specific financial needs of both retail and business customers, attractive interest rates, structured repayment plans, easy access to all funds and fast and prompt customer service.